Wielding an axe with a maniacal look on your face is not going to win you any friends at all, that is for sure. However, there are moments when you would like to indulge in a little bit of cosplay, and with Halloween coming up, it certainly does not hurt at all to play the devil’s advocate and start getting the relevant accessories so that you are able to look the part of a homicidal maniac. 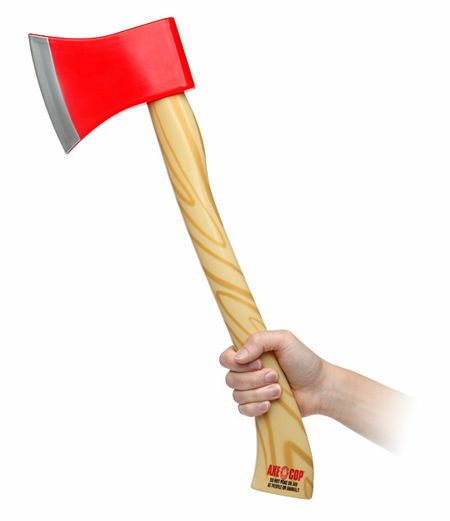 The $19.99 Axe Cop Roleplay Axe is a replica of the perfect axe, which is similar to the one that the Axe Cop uses, and since this is a ThinkGeek creation and exclusive, you know for sure that you are unable to find another one just like it elsewhere. Made out of plastic, it is not going to chop off anyone’s limbs, so feel free to go nuts with this.